Starting in the newspaper industry more than 20 years ago, my journalism and communications skills are the foundation on which my marketing and consulting experience continues to grow and evolve. I founded Tait Enterprises in 1999 during the economic and marketing heyday to help ensure I'd always have an avenue to explore projects beyond — and in addition to — the 9-to-5 ones. 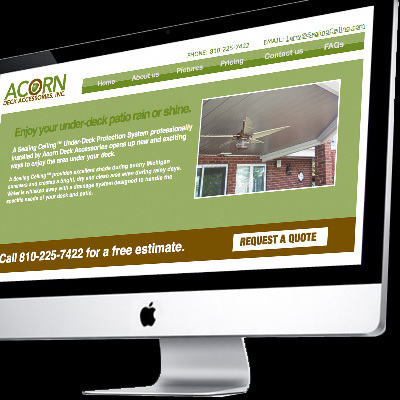 A significant portion of projects during the first few years were turnkey items for the Turgeon Group — a marketing and communications agency based in Madison Heights, Michigan. In the subsequent years, I've worked with a wide range of clients on a variety of projects — from business cards and brand identity pieces for startups, to website design and training. As a freelance venture designed to extend my knowledge and hone my abilities, I'm able to be selective when taking on new projects and clients — focusing on quality rather than quantity. If you're a small business. If you're an individual working on a personal project. If you need help. Drop me an email and let's chat. SealingCeiling.com: Brand identity, web design and development, domain and hosting setup, business cards.